One of the most easily available of the lovebird species, the Fischer’s lovebird has been revered as a pet ever since it was bred in the US for the first time in 1926. 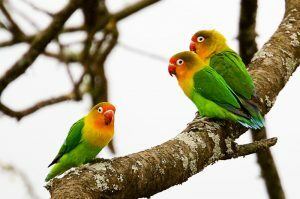 It is, like all other species of its kind, extremely protective of their mate, and has been known to be monogamous for a lifetime. 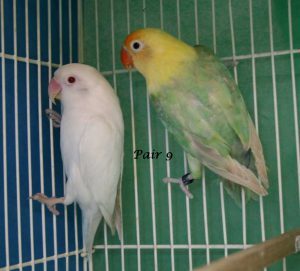 In fact, if separated, neither party is able to maintain good health, physically or mentally. 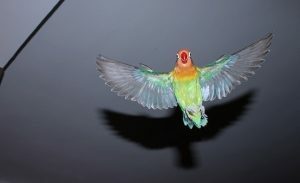 Color Bright green body, blue hues on the wings and tail, yellow upper breast and collar; head is olive green and the face, reddish-orange; characteristic white eye-rings, and a red beak. 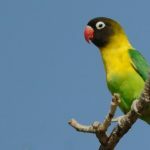 Diet Foragers for seeds and fruits like small figs; known to flock into agricultural areas to feast on maize and millet. Its jovial nature and handsomeness make it an ideal, and a rather popular choice as a pet. 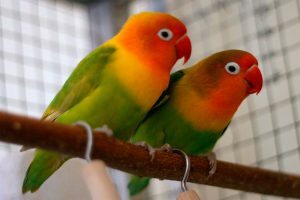 The most important thing to remember is to never keep lovebirds alone in an enclosure, make sure there are two, a male and a female. 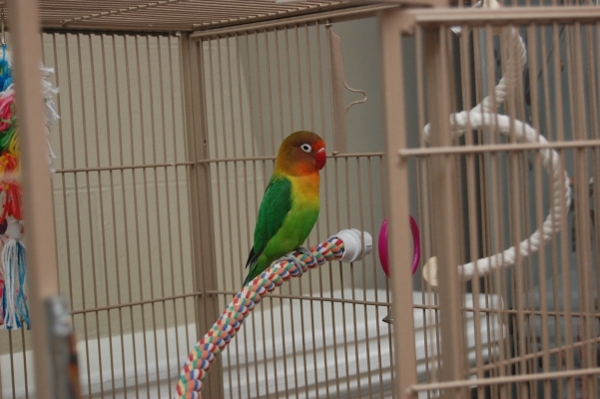 An ideal cage would be of dimensions 18”x18”x12”, with the bars spaced at no more than ¾”. 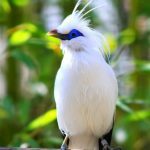 They are known to have made their way out of the cage on occasions, so the doors of the cage should no be such that the bird can open easily. 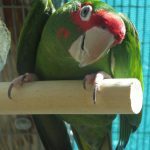 Cages must be cleaned daily, with complete disinfection, while the food and water dishes should be done at least once a week. 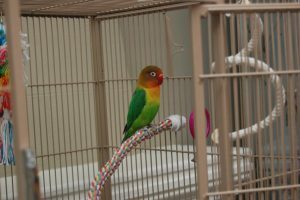 Perches of various sizes, shapes, and textures (wooden or metallic) should be provided, along with toys and papers, the latter because it is one the Fischer lovebird’s favorite items to chew on, especially during the breeding season, which, for captive lovebirds, last year-round. 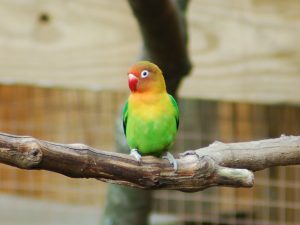 An adult Fisher’s lovebird can withstand temperatures as low as 50°F (10°C), but a juvenile can only withstand temperatures down to 59°F (15°C). Fischer’s lovebirds are as intelligent as they are inquisitive; a similar trait to that of larger parrots. 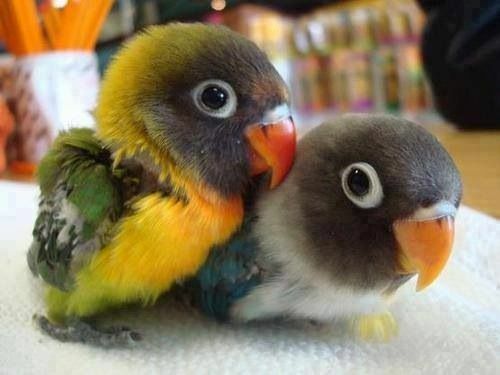 When let outside they like to preen on the owner’s hair and clothes. 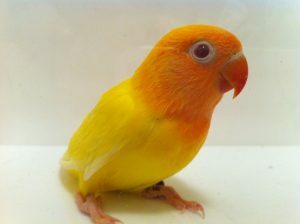 Females of the species are more aggressive than the males, but with proper training, especially from a young age, they can bond well with their owners. Fischer’s lovebirds should mostly be put on a diet of high-quality seed mix, occasionally combined with fruits and vegetables. 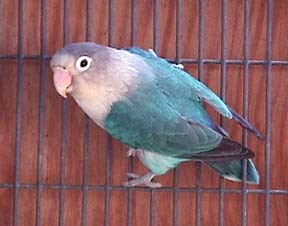 It is also important to supplement their diet with bird-specific vitamins and minerals. 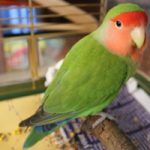 Remember to never feed avocado and chocolate as they are highly toxic and can cause severe health problems. 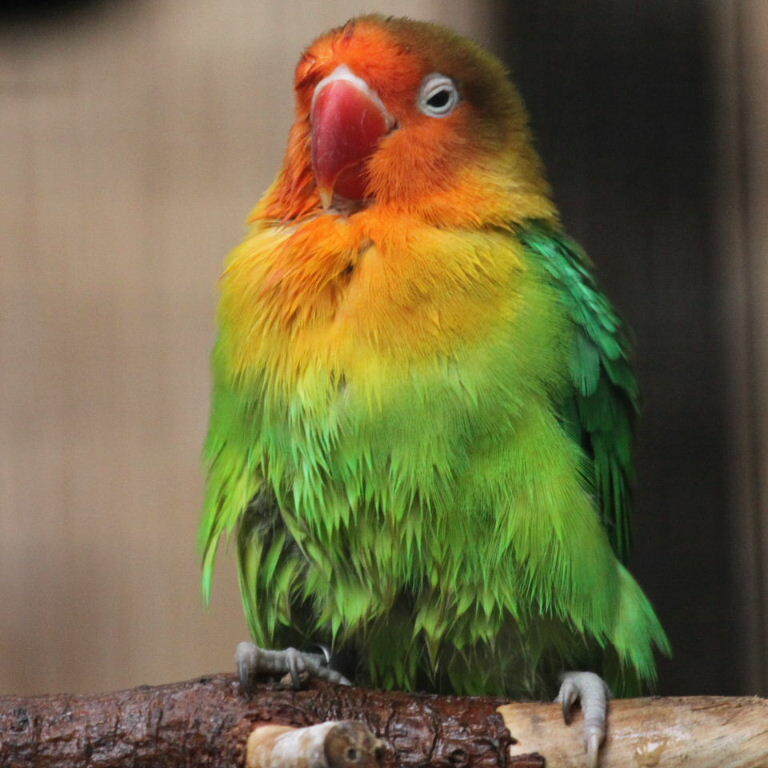 The Fischer’s lovebird loves to bathe daily; this can be done by providing them with a flat earthenware dish filled with water, or simply by spraying them with lukewarm water. 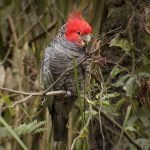 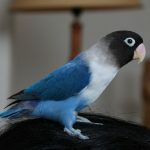 They love to groom themselves by maintaining their beaks and nails, so, if you have provided them with a few wooden perches, the bird will take care of itself. Symptoms to look out for include lack of energy, standing with its eyes closed, ruffled feathers, runny nose, watery eyes, and excessive sleeping. 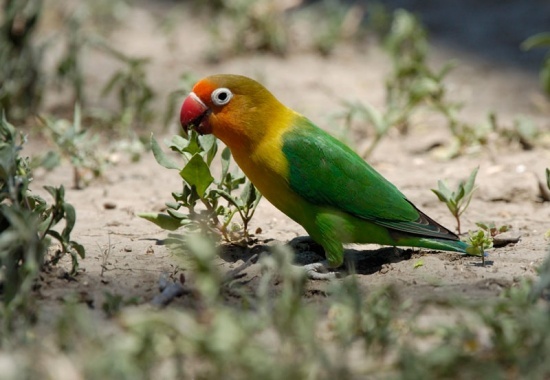 Common ailments that plague the Fischer’s lovebird are psittacine beak and feather disease, yeast infections, avian pox infections, internal parasites, bacterial infections, polyoma virus infections, ticks, mites, egg binding, respiratory problems, etc. 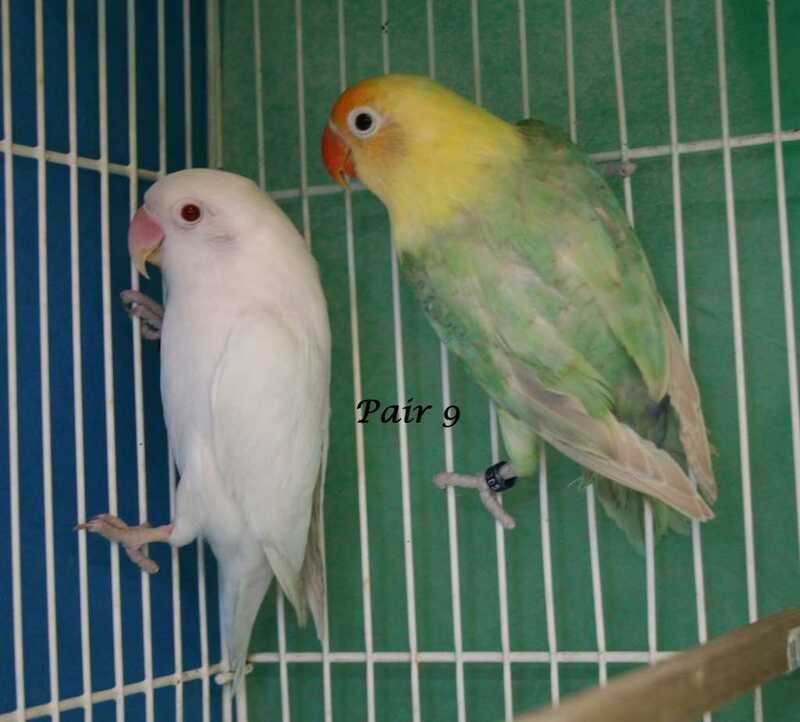 A pair of Fischer’s lovebirds can cost you between $100-$150. 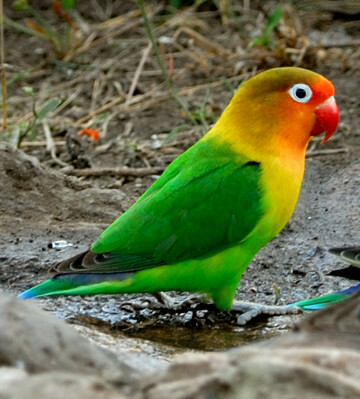 The Fischer’s lovebird has been named after the man who discovered the species in the late 19th century, Gustav Fischer, a German explorer. 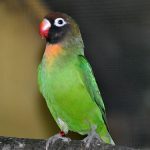 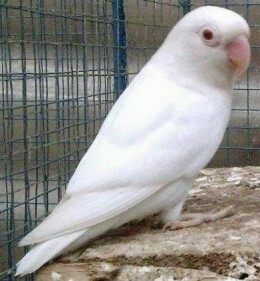 This is the third most readily available of all lovebird species after the peach faced and the yellow collared varieties. The genus name of the lovebird, Agapornis, is a combination of two Greek words, ‘agape’ meaning love, and ‘ornis’ meaning bird.